Across the Atlantic in New Jersey, photographer Jeff Berke enjoyed a similar Leonid moment: "I saw a Leonid Fireball around 4:20am that lit up the sky creating shadows and a smoke trail which lasted close to 45 seconds. It was an incredible night!" The shower is subsiding as Earth exits the debris stream of parent Comet Tempel-Tuttle. Tune into SpaceWeather Radio for farewell echoes. "What a beautiful view," says Ramakers. "Wow--would I like to image this if/when it collapses! Can’t wait to see what tomorrow will bring." Indeed, the future could bring some action. 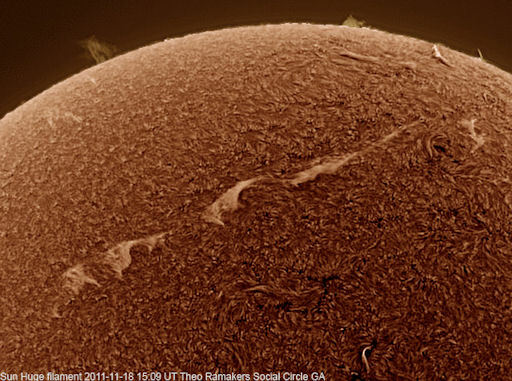 Filaments like these have a habit of collapsing, and when they fall to the stellar surface the impact can trigger a Hyder flare. Readers with solar telescopes are encouraged to monitor developments. On November 19, 2011 there were 1256 potentially hazardous asteroids.